Everybody knows that scent is the most powerful of our senses. So it is no surprise that sometimes a smell can warp you right back to an unforgettable moment on a trip or an amazing experience while travelling, sometimes bringing back memories more vividly than a photo album can. I have got a few of those. Good and bad. An obvious one is body products that smell of coconuts. As soon as this wonderful scent wafts into my nostrils, I’m mentally transported to a far flung beach with lots of palm trees and clear blue water sprinkled with blue starfish. 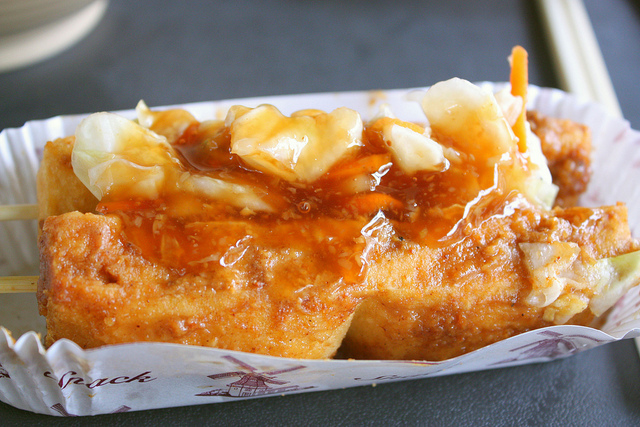 A slightly less pleasant smell is the Chinese stinky tofu. As pungent as this Chinese delicacy reeks, smelling this will conjure up memories of my trip to China a few years ago where I wandered around the Muslim Market in Xian, discovering all kinds of weird food types. I tried a good few, but the disgusting smell of the stinky tofu made me very reluctant to try it. Although I have heard good things about it. Then there is the durian. The fruit from hell. I was introduced to this stinky number growing up in Jakarta in Indonesia. I remember being driven to school with the windows down, till we passed the street vendors selling durian and those windows went right back up. It is worse than a human fart. And from what I remember, it tastes just as foul. And there are loads more. Car fresheners, you know those ones in the shape of a Christmas tree, make me think of road-tripping through the USA. So does apple and cinnamon potpourri for some reason. The smell of actual fern trees, on the other hand, reminds me of my childhood summer holidays down in the south of France and north of Spain. As does the smell of an over-packed car interior that has been out in 30+ degrees for way too long, stuck in a traffic jam somewhere halfway between Holland and the Costa Brava in Spain, with my brother and I fighting in the back seat. That last one though, is one memory I'm maybe not so fond of. It amazing the way scents bring back memories. Right. It is apparently the most powerful of our senses. I think I would like a waft of durian, very quickly. I saw all the signs on the Singapore metro about it being banned, but I really want to know just how bad it is! haha, it is super bad. I don't get why one would eat it. haha, yeah I do not really miss that sucker either. Gaaaaahhh... DURIAN!!! It's the fruit from hell indeed. Not sure if you know about this cologne range back in the day, "Angel's Breath"? The smell of durian is seriously my idea of devil's breath!!! haha, that is very well put. How nature was able to create something like that, is beyond me. The smell of the overpacked car interior in summer... ooh I know exactly what you mean! Everyone's childhood right there! The joy of going on holidays in the 70s and 80s. I love how scents can bring back all these wonderful travel memories. I am envious of your visit to the markets in China! They were quite something indeed. Lots of weird stuff that I was too afraid to try. Yes, totally. I reminds me of Christmas in the USA. Stinky tofu? No thanks. I find normal tofu offputting enough so stinky tofu would have been an instant veto for me. 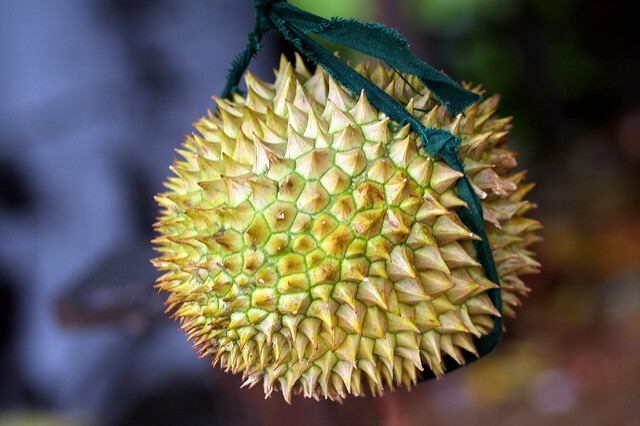 I have never smelled a durian and I'm certain I don't want to! However, I would very much like to visit the location of your first picture. Where is that please?? haha, yeah I will leave the stinky tofu to others as well. The first picture I actually took on the beach in Grenada. It's Grand Anse Beach. Lovely there. I agree, I'm also not keen on durian AT ALL. But coconut bringing back memories of island holidays, yes please! Thanks for linking up! No worries. It was a great topic this month. And the most powerful of our senses, so I have been told. haha. I have actually never tried it either, but that smell!!! Why would you wanna try it? I can't stand durian, but my family LOVES it! So much so that they order durian desserts while I sit back and hold my nose. Ha! The first time I bit into one, it tasted like raw onion to me. I tried -I really did. OMG, that is so brave of you. I will not touch it with a stick. Ever. Haha, I can't imagine having to smell that every day. Ahh...stinky tofu...tastes as bad as it sounds! They say it grows on you, but life is too short, so many other delicious street foods in China..once was enough for me! I know right? Why try something that smells like crap?